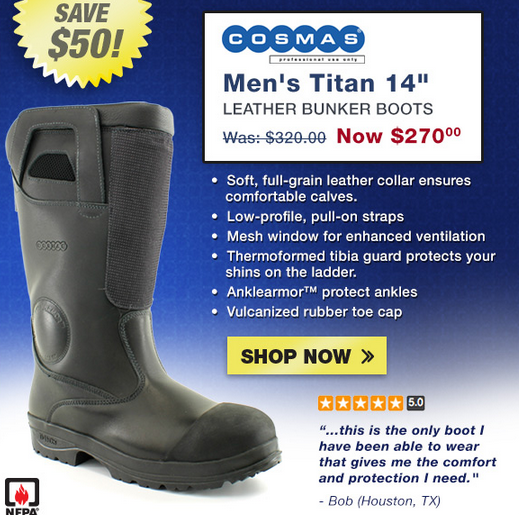 Right now you can get the Cosmas Men's Titan 14" Leather Bunker Boots for a steal of a deal! A $50 savings is nothing to shy away from, and not for boots with high customer ranking and satisfaction like these! The Cosmas are a boot where tradition meets innovation. They're made of a beautiful soft, full-grain leather collar that ensures comfort around your calves. The sleek, low profile design is one our wearers love. Not to mention the triple-reinforced pull-on straps help you get in quickly with zero hassle. The mesh window is great for enhanced ventilation when you know your feet are working hard and need a breather, and the thermoformed tibia guard protects your shins while up on the ladder. The supportive heel and arch will keep comfort and support where needed if you have any foot troubles, or to avoid foot troubles. The high traction rubber sole helps to promote a natural walking motion and will make sure there's no slipping while on the scene. Get your 14" Cosmas Leather Boots for $50 off today! It's that time of year again and winter is fast approaching. When winter comes, the days shorten and the weather gets colder, much colder. What this means for our closet? That means we have to put our summer clothes and shoes in the back of the cupboard until next year, and carry out our winter wool winter shoes. I find this website for Best Waterproof Steel Toe Work Boots. Before spending $100 or more on new running shoes, you need to know what style of cushioning shoes to buy. To stay active and fit, you need to make sure that your joints are protected from the impact of exercises like running. Three major factors influence comfort and health. The best running shoes should correct your gait, properly position your foot, and provide maximum cushioning. Every foot is unique, and different shoe designs correct different problems. I find a website for the Toe Guards For Work Boots. If you want you can visit this site.